Digital marketing -- actually the entire digital world -- never stands still. Change is inevitable and continual, which is why conversion rate optimization and continuous improvement are so important in a digital marketing program. In fact, 62.7% of consumers say online reviews are “important” or “very important” when choosing a local business or making a purchasing decision. Even if you’ve never collected online reviews and have no idea how to do this, this is a strategy and opportunity that should be uncovered and recommended as part of your digital marketing program. This is the type of strategic recommendations based on your target audience, buyer’s journey and goals that a digital audit should be uncovering. It’s more than just tools and tactics. So, how do you uncover gaps and opportunities such as these? It’s clear consumers use and rely on the digital world to make decisions; however, they use the many digital mediums and channels in different ways and at different times in the buyer’s journey. A cookie-cutter approach does not work in digital marketing, and therefore, also does not work for a digital audit. That’s why the most effective digital audit applies a sales funnel orientation based on your unique buyer and buyer’s journey. Instead of evaluating digital tactic by tactic (such as email, SEO, social media posts, etc. ), a sales funnel approach to a digital audit looks at how your online buyer behavior at each stage aligns with strategy, tactics and company goals. You could have all the digital tactics in place and see no results because the tactics are not what the buyer is searching for, not how the buyer wants that information delivered or not aligned with your sales team’s process. A digital audit should analyze all aspects of your online brand and how the elements interact with each other at each stage of the buyer’s journey to help you identify gaps, opportunities and where you can capture your greatest ROI. The outcome should be what is working and what is not working at each stage of the funnel so that can be translated into a strategic action plan that get results at each stage and ultimately captures higher conversions. Personas. The key to a successful digital strategy is to understand the persona - your target audience and how they search and make decisions in your market area about your particular service. Are your current strategies and tactics aligning with your personas? Map out a persona-based content strategy to see gaps. Goals. For a marketing plan to be truly effective, it must align with the bigger picture goals. Do your digital marketing goals align with the broader business goals and your sales team’s goals? Have SMART goals been set around things such as brand awareness, quality leads, lead conversion, new customers, customer retention, revenue or a new service, product or market launch? Next move onto analyzing each element of the sales funnel. Start with the Awareness Stage, also called Top of Funnel. This is where your persona begins their search for educational, helpful information to solve a problem — will they find you? What will their first impression be? In this stage of the funnel, elements to be considered include a website, social media, SEO, blogging, and PPC. Are you capturing optimal ROI from your PPC? How often are your PPC campaigns optimized? The website is the first impression of your organization. How “easy” is it to navigate your site? This can determine how prospects judge your services -- remember perception is reality. It’s important to make it easy to do business with you. If you don’t implement Search Engine Optimization (SEO), your target audience will likely never find you online. Your website must be optimized in order for search engines to understand your site and show it to the right audience. What offline and online SEO are you implementing? There are over 200+ technical elements that go into SEO. Look at your traffic. What’s organic vs. direct vs. social vs. PPC? Evaluate your online content and imagery for TOF educational content. Is it using the right language, terminology, and images? Is it speaking clearly to your persona and guiding them through your website? Do the images build a sense of confidence and trust in your brand? Are you using the right forms of content, such as blogs, white papers, infographics or videos? Evaluate your social media channels. Social media constitutes the main way people form an impression about a brand or organization; however, many brands do not take social media as seriously as they should. Many brands have social accounts that are languishing and forgotten or they have no idea what to post on social media. Some have accounts on different platforms that look like they belong to different brands. Still, others have no clearly defined schedule or goals for their social presence. The middle of the funnel is where visitors are considering and comparing. It’s the most critical stage of the visitor process — it is where a visitor converts from a visitor to an actual lead. For this, you need a well-designed content strategy that provides the depth of content that your persona is seeking. Which web pages need to be optimized whether for SEO elements, more relevant information or improved copywriting and editing. Which pages should be consolidated due to overlapping topics or low time on page. Which pages should be pruned off the site and what the approach to pruning should be. Priority for the various types of content (blogs, white papers, email, webinars, case studies) and strategic placement on the website and through the use of lead nurturing tactics. Content gap opportunities to drive content ideation and editorial calendars. 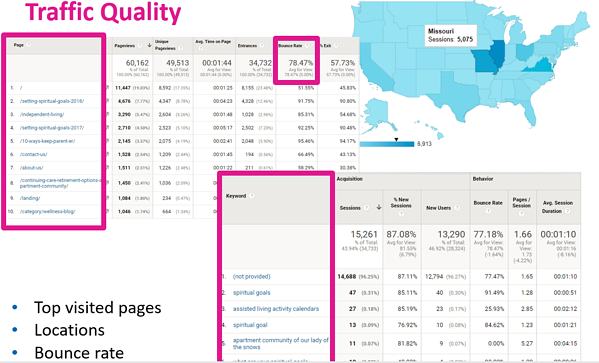 Which pages are ranking for which keywords. Which pages "should" be ranking for which keywords. The strongest pages on a domain and a strategy to leverage them. By producing the right content, at the right time and in the right channel, you can capture a potential lead’s information and nurture them through the sales funnel. In the Bottom of the Funnel, potential customers are almost ready to purchase, talk to a sale rep or schedule a visit. In this stage of the funnel, it’s important to provide strong offers that appeal to these customers as well as 3rd party support sources. Evaluate your website, email campaigns and sales team collateral to see what content and strategies exist at this stage. Is personalization being incorporated into any automation tactics? What digital inbound sales systems, tools, and processes are being used? How are they aligned with marketing tools and systems? The post-customer experience is equally as important as that first impression. In this phase of the funnel, identify if strategies for customer relationship management, upsell and advocacy are evident and working. An audit would not be complete without evaluating two important elements: people and skill. With the depth of knowledge required to manage a digital marketing program, it’s impossible to expect one person to have all of the knowledge and skills necessary to develop and execute both a traditional outbound and digital inbound marketing program. For example, developing online content that gets results is a challenge for many. 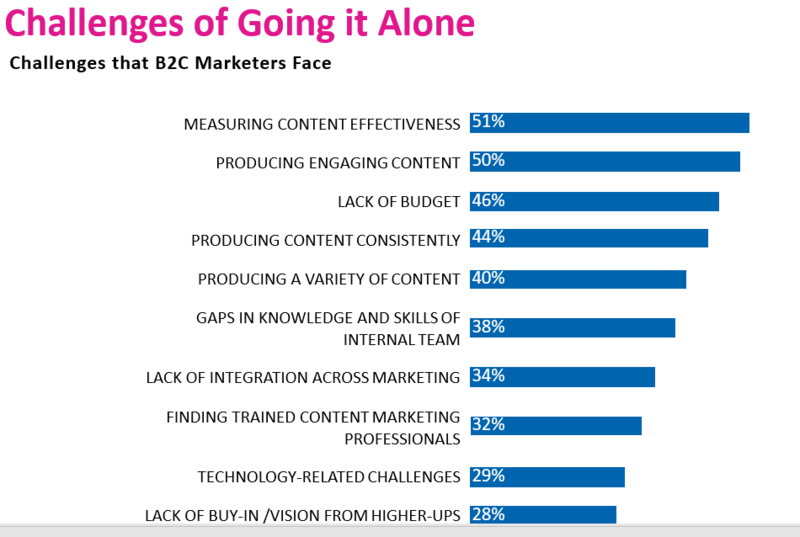 A 2015 B2C Content Marketing Trends-North America study found 50% of all marketers surveyed cited producing engaging content as a challenge. Another 44% are challenged with creating content consistently. Evaluating the tools and system utilized within your digital marketing audit is also important. We’ve found many marketers today are only using about 20% of the capabilities of their platforms.Take the time to review all features and functions of your platform and the use of automation. The inbound marketing methodology, which is based upon data, requires an automation system that collects robust data. It not only automates your content distribution through social, blogs, email, etc., but also helps facilitate the conversion process from visitor to an active lead. It, in turn, supports nurturing your lead into a customer. It allows you to not only streamline and automate marketing tasks but also to get feedback on what’s working and what’s not. For example, marketing automation software can send emails to segmented prospects based on the actions they take. Your prospect feels like you are talking to them and are more likely to engage with you and convert into a sale. Your sales team can also see how they are engaging with your brand. 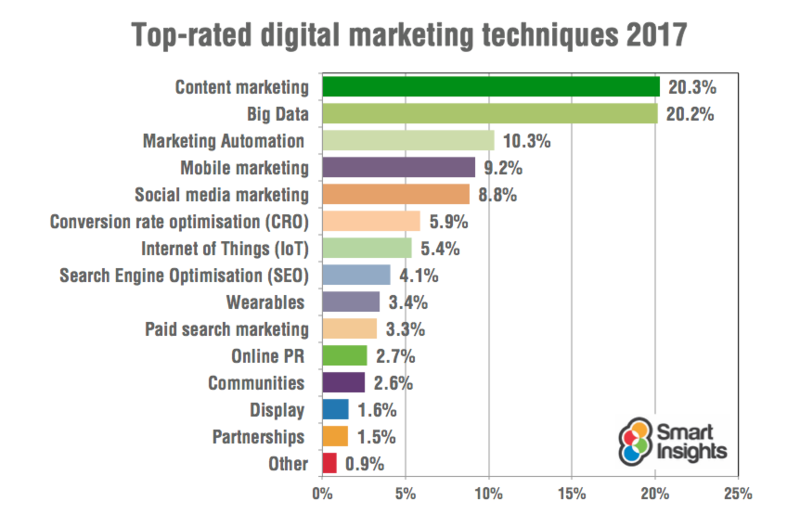 Are you using these top rated digital marketing techniques? Begin with the end in mind. Strategy is about making the choices necessary to distinguish an organization in meeting customers’ needs. That’s why it’s important to base your audit on your buyer’s journey and understand goals, barriers, limitations, services, market share, value proposition, etc. Finding the data is one thing, but to be truly effective, an organization needs to understand what the data means and how to translate it into a strategy that aligns with your customers at each stage of the sales funnel. An effective audit should be more than evaluating tactics and tools. The inbound methodology is about delivering the right content, at the right time, in the right channel to attract and retain customers. It aligns with your buyer’s journey. Having the right tools and people in place are important in order to make digital marketing successful. Bottomline, a results-driven digital audit should uncover barriers and opportunities at each stage of the buyer’s journey in the sales funnel and provide you with clarity, confidence and an action plan that enhances the ROI of your digital marketing program.